Tallahassee mayor Andrew Gillum, 39, stunned his opponents with an upset victory Tuesday amid the highest turnout for a midterm primary election in Florida history. Gillum - who received a major boost in the campaign's final days from Bernie Sanders (I-VT), held an unofficial 3% lead over his closest rival, former US Rep. Gwen Graham (D), with 94% of the votes counted. In particular, Gillum "overwhelmed" Graham in Democrat-rich Miami-Dade and Broward counties by more than a 2-to-1 margin. The "charismatic and proudly liberal Gillum" ran to the left of his rivals, according to the Miami Herald, despite being vastly outspent. His message of social justice and lifting up the downtrodden won over Florida's "growing diversity." Following her loss to Gillum, Graham called to congratulate him, saying "Andrew, go out and win this damned thing." 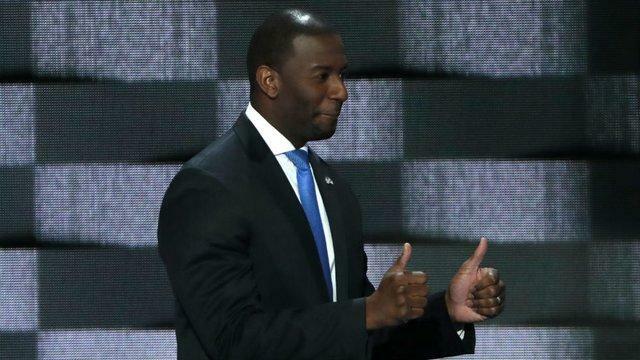 Gillum was described by former presidential candidate Bernie Sanders as leading a "political revolution" in Florida. Gillum struggled early in the primary race, often saying he was the only "non-millionaire" in the running - casting himself as a champion of lower and middle-class Floridians. His progressive agenda includes support for a $15 minimum wage and Medicare for all, as well as vehement opposition to the Stand Your Ground self-defense law which indemnifies people who use force without retreating in order to protect themselves against threats or perceived threats. Gillum rose to a historic victory despite a long-running FBI investigation of possible corruption at Tallahassee City Hall, for which no charges have been filed. The probe focuses on development deals involving the city's Community Redevelopment Agency as well as a former Gillum political ally. The Tallahassee mayor's victory amounts to the largest political upset for a progressive candidate since Alexandria Ocasio-Cortez's June defeat of Rep. Joe Crowley (D-NY), the fourth most powerful Democrat in the House. Gillum will now face off against Rep. Ron DeSantis (R-FL), setting up a battle of two "diametrically opposite populist agendas," according to The Hill. Gillum and his allies argued that Democrats had for too long banked on middle-of-the-road candidates to win elections, effectively shutting the party out of the governor’s mansion for two decades. The win by the Tallahassee mayor proved a progressive can win a primary in Florida. But it remains an open question whether that same agenda can win over voters in the general election. Gillum will face DeSantis, who has hitched himself closely to Trump's populist agenda, pitting two diametrically competing ideologies against one another. Between far left candidates and populist conservatives, the establishment is slowly ceding power to the next generation.